The average length of time coffee stays hot in a box is about 16 minutes. Assuming an average transit/set-up time from your store to our meeting room is 14 minutes, that leaves 2 minutes on the ticking clock of hot coffee. The average duration of a meeting for which outside food and coffee is procured is 2 hours. Do the f%&king math. 2 minutes of hot coffee, followed by an hour and 58 minutes of nasty luke warm coffee. And, it’s your logo on the box. You may also remember that at a certain morning-after brunch following a certain 50th b’day party, the caterer provided the evil coffee-in-a-box. What we learned from that experience is that the first few cups from each box (this is especially fun during those precious 2 minutes while the coffee is still hot) end up either on the person seeking the cup of coffee or on the floor. 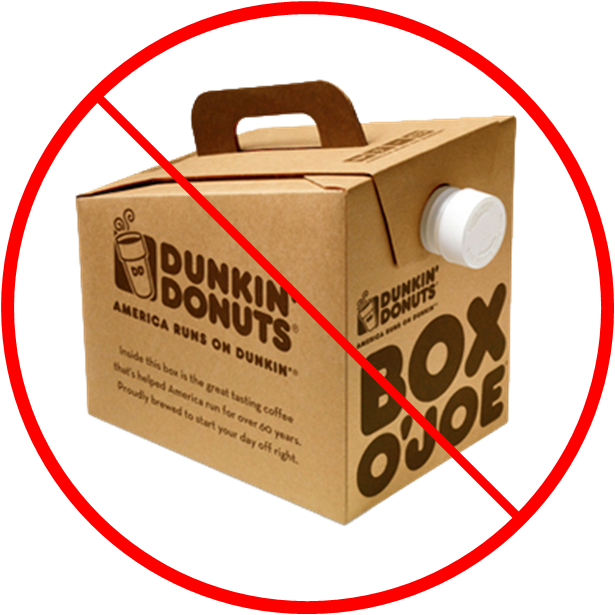 So while the box makers are redesigning their box to provide better insulation, they might also try to figure out a way to design the container so that the coffee poured from it actually goes into a cup held in the position a reasonable person would put it if he or she were seeking a cup of coffee.